I’ve made my living for years as a corporate recruiter in the online media industry with an emphasis on online advertising and content creation. In short, I’m the guy who goes out and finds and recruits top content creators and revenue generators for the biggest digital media and entertainment companies, businesses like Disney, Yahoo! and NBC Universal who demand the best talent out there. One of the benefits of my role is that I get to learn how companies make money and how they structure their organizations. It’s a great job and I value my experience as much as my college education but it’s not who I really am. I am an inventor, designer, and entrepreneur and I am bringing one of my inventions to market. I’ve created a product line called Heavenly Pals which address a unique consumer need. Heavenly Pals are high-quality plush dogs, similar to those found at high-end toy stores like FAO Schwarz, that offer a whimsical (and huggable) alternative to traditional urns for dog-owners who have lost their beloved pets. I will eventually create a cat line as well when the market demands it. After several years of trials and tribulations, more failures than successes, and significant investment of my own money, I am pleased to say that I am ready to bring Heavenly Pals to market. I have developed great production prototypes for the top 10 dog breeds and I have found the right manufacturing and retail partners to reach my target audience. If you’re an inventor like I am, this is really a great feeling. Getting retailers to buy and sell your product is like going to the Olympics and coming home with gold. While I am starting with a really unique product line I do plan on expanding to more breeds and cats as well as more traditional lines of plush and other pet-related products as the market demands. As an inventor, I am just excited to see the first of many ideas be successful and take off. 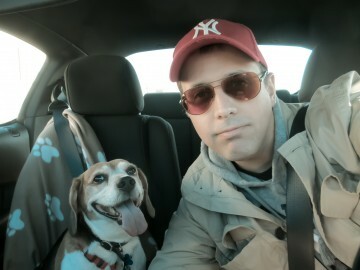 I live just outside New York City with my 8 year old beagle named Bailey, or Bailey Franklin Pearce when he’s up to no good!